The winners of the ALDC Campaigner Awards 2013 were again sponsored by Midshire. They were presented at the ALDC AGM held in Glasgow at Federal conference by Veronica German – President of ALDC and Sir Nick Harvey MP. The campaign for 2014 started as soon as the results were announced in 2012, despite 2013 being the “fallow” year on Kirklees Council they carried on campaigning and did not let the target wards reduce their campaigning activity. They made history by making the first Liberal Democrat gain from Labour in a Metropolitan Authority since the 2010 General Election. The Liberal Democrat group despite being second smallest routinely contributes motions, amendments and questions at Council, with every ward expected to contribute to each meeting. 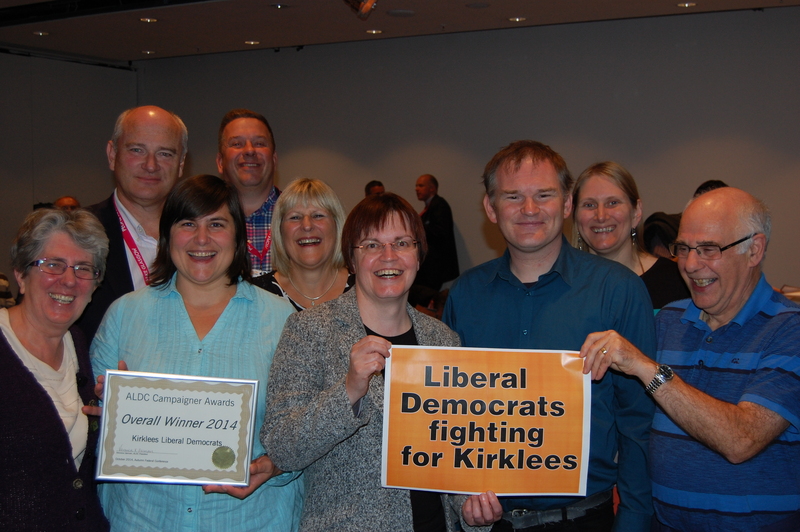 As a result the Kirklees Liberal Democrats held 5 council seats and did not lose any. Signed up 343 addition Lib Dem voters for postal votes. Achieved turnout of 84.4% by identified Ds and Ps postal voters. Significantly increased majority over Labour in what had been their No. 1 target seat. Lorna Dupre gained the seat from the Conservatives, coming from third place in 2011 to take 50.9% of the vote, an increase of 27%, a remarkable achievement in a four-way contest. The local team had been preparing for the 2015 local elections since 2013 so were well established and ready to go as soon as the Conservative councillor resigned. They canvassed extensively, ran a well-targeted literature and letter campaign as well as ward-wide leaflets, and made good use of social media. Bristol Liberal Democrats ran a fantastic community campaign to save Hengrove Play Park in South Bristol. The Mayor’s draft budget had severe cuts in parks which would have effectively closed it. The Mayor was genuinely surprised at the strong reaction and the force of the campaign. The success of this campaign was largely due to the fact that it was “owned” by the local community and particular the parents of children who used the park. Lib Dem Councillors complimented this by helping to coordinate the campaign and manage data. It is a true example of Liberal Democrats being working strongly with a community campaign. For the combined local & European elections in May 2014, Sutton had messaging that integrated national, local and European messages very neatly and successfully (they were the only Borough in London where the Liberal Democrats made gains in May, in an area where we have run the Council since 1986). We will be running a series of articles on these winners in the members only area of the ALDC website over coming weeks. To join and access them click here.